Did you know that thousands of poker players around the world compete online with millions of dollars worth of real-money prizes on the line? It’s true. Although the industry has changed considerably over the last 20 years, “real money poker” is used to describe any online poker game where actual cash is wagered. There’s also a wide selection of free-to-play poker games but anyone looking for an experience that’s similar to what you’d find in a brick & mortar casino or cardroom will likely want to stick to real money online poker. You can win real money. Arguably the best way to get better at the game. Perhaps most importantly: It’s fun! It comes as a shock to most people that that online poker is a legitimate multi-million dollar industry where skilled poker players are able to carve out a significant living playing cards. Actually making a full-time living from online poker is a serious challenge that’s not for everyone but that doesn’t mean there aren’t countless recreational poker players who manage to score some serious spending money. Don’t forget that amateur poker player Chris Moneymaker qualified for the 2003 WSOP Main Event through $40 online satellite and went on to win the entire thing for $2.5 million to gain instant fame and fortune. While most players won’t ever reach Moneymaker levels with their poker game there are plenty of part-time poker players who love the convenience of online poker and play for the sheer entertainment value. Not to mention the joys of playing poker anonymously in your underwear from the comfort of your own home! There’s a very good chance that the first online poker that people experience will be a free-to-play game like Zynga Poker or World Poker Club on Facebook. Play money poker is actually a fantastic way to get acclimated to the structure of the game and how basic poker hand rankings work. You can do that all without losing a dime. The problem is that once you’ve learned the basics, play money poker can actually be a detriment to improving your skills at the game. People play differently when there is nothing at stake and you will often find people shoving all-in on every hand. That’s not how real poker works. You’ll notice the game is very different — even if you’re just playing for pennies — and that’s a great reason to move to real money poker as soon as possible. If you get good enough you might even be able to play with a positive win-rate and potentially earn some cash on the side. Or impress your friends at your local home game. Is it Safe Wagering Real Money Online? You might be surprised to learn that the vast majority of real money online poker sites are 100% safe and secure. There were some issues with sites in the early 2000s when online poker was being developed but the entire internet has changed considerably since then. These days no one bats an eye at handing over credit card information to make a purchase on Amazon or eBay and online poker security has gotten immeasurably better. Because of the initial issues with online poker, the individual companies behind the industry have worked very hard to secure their platforms with tools like authenticated random number generators to certify their shuffles and segregated accounts for player funds. Most online poker sites are also audited by official gaming regulators. These days online poker sites also offer fully developed support components with live chat, email and phone elements. If you have questions you can generally get them answered ASAP. Perhaps the best reason to trust online poker sites is that it’s in their best interest to protect players and their funds. The idea for successful online poker site is to offer a permanent place for people to play cards. Is It Legal to Play Poker for Real Money? It’s definitely legal to play online poker for real money in most jurisdictions. Players are generally never prosecuted for playing online poker. Sometimes operators have gotten penalties from governments but individual players never get charged. In fact, in the long history of poker in the USA no individual player has ever been arrested for playing online poker. Of course the laws and regulations regarding online poker around the world are complex and always changing. Most countries restrict the poker sites that are permitted to operate inside their borders. Some countries go with state-run sites while others opt to tax already existing poker sites. There are also countries that don’t restrict or tax online poker in any capacity. The one thing pretty much every country has in common when it comes to online poker is that online players don’t get prosecuted at any individual level. You should always check the laws in your local jurisdiction but chances are you’re not going to get it any sort of trouble. In fact you’d have better odds of hitting back-to-back royal flushes. Will I Lose Huge Sums of Money? This is a common misconception about poker. You can only lose what you bring to a table and you decide how much you want to bring to the table. If you want to play micro stakes and play $.01/$.02 then you can do that. You’ll take $1 to the table and you’re only at risk of losing that $1. Proper bankroll management is a huge component of how professional poker players consistently earn income. The idea is that you only risk a small amount of your overall bankroll on an individual game. That way no matter how bad the game goes you’ll still be able to play poker. You can play a surprisingly large amount of poker for an initial deposit of $20 or $50 depending on the poker site you want to play. Some poker players need to play for significant amounts of money and would be happier playing $1/$2 and will want to deposit several hundred dollars at a time but the vast majority of poker players start out grinding the micro stakes. How Do I Deposit Real Money Online? 3. eWallets like PayPal or Neteller. 4. Bitcoin (or other cryptocurrency). The process of getting money on an online poker site is not unlike putting money on your PayPal account. It generally takes a set amount of time (anywhere from 15 minutes to a week depending on your method) and a series of identity verification steps. Credit cards are generally the fastest way to get money online but the fees are generally steep. Bank transfers are the cheapest way to get money online but they also take the longest and are the most complicated. Bitcoin is quickly becoming one of the best ways to get money onto online poker sites and it offers some of the fastest deposit and withdrawal times. While online poker is completely anonymous the poker sites themselves will likely require some form of ID to make sure that you’re not underage. Underage gambling was previously a big problem in the online poker industry and poker sites have put serious safeguards in place to avoid that issue. 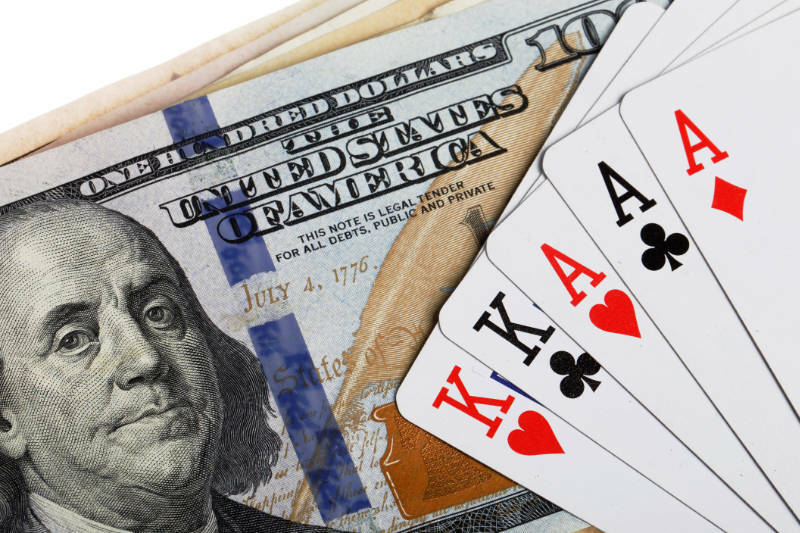 What Are the Most Popular Real Money Poker Games? 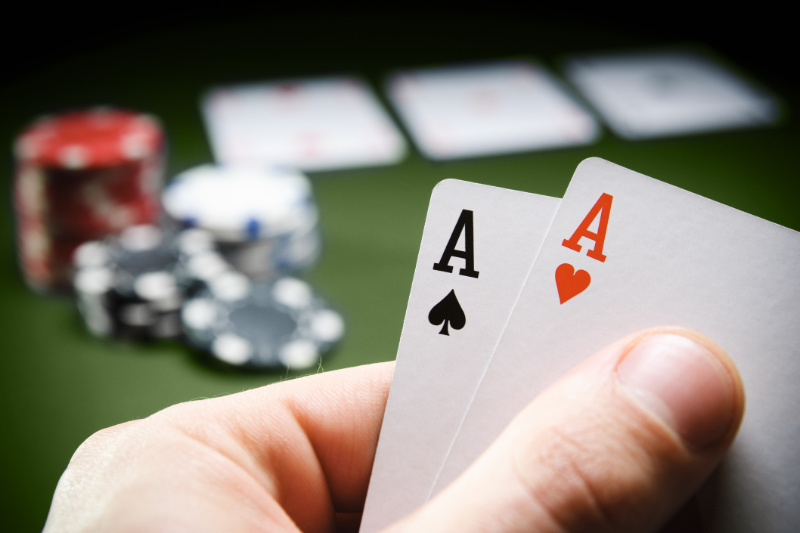 The most popular poker game in the world is No-Limit Hold’em. It doesn’t matter if it’s real money or play money, people can’t get enough No-Limit Hold’em. No-Limit Hold’em has proven to be a modern-day poker classic thanks to it’s easy to understand ruleset in addition to the incredible depth of strategy. It’s also one of the most exciting games thanks to the fact you can go all-in at any point you choose. 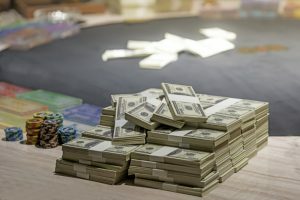 While the vast majority of online poker games take place in No-Limit Hold’em there are a number of other games that are played for real money. Pot-Limit Omaha is probably the second-most popular game behind Hold’em (which makes sense because it’s basically No-Limit Hold’em with four cards). There are also some select online sites that offer truly obscure games like Chinese Poker, Fusion Poker, Badugi, Open-Face Chinese Poker and Five-Card Draw. There are also formats that only work online. One such format is “fast-fold” poker (which has different names across various sites). Fast fold poker allows players to fold their hand and instantly be transported to a different table with a new hand. It might sound a little weird to an old-school poker player but fast-fold poker is a fantastic way to skip your worst hands and instead focus on playing strong hands in interesting pots. It also lets players record a higher number of hands, which can be helpful for the educational process as well as unlocking loyalty points. What’s the Actual Process of Signing Up for Real Money Poker? The process of signing up for an online poker site is relatively simple but it does vary a bit between online poker sites. Most of the time it shouldn’t take very long if you’re in a country that doesn’t heavily restrict online gaming. Generally most online poker sites will require some or all of the following steps. 3. Provide proof you’re of age to play. 4. Hit the cashier to make a deposit. 5. Choose your method of depositing. 6. Wait for the transaction to go through. Most of the time players will be able to go through all those steps in a short amount of time but there’s also a chance there will be a few hiccups along the way. If you’re really interested in playing online poker don’t let the challenges stop you from playing real-money poker. The extra work to play real-money poker will give you a chance to win real-money prizes and vastly improve your game. Why Do Some Sites Restrict Players by Country? To say online gaming is complicated from a regulatory point of view would be an understatement. The global market was not prepared for online poker on an international scale when it debuted in the late ‘90s. There were no previous laws in place to restrict or regulate online gambling and poker sites flourished but were also mismanaged and players sometimes suffered. Fast-forward 20 years and governments are much more sophisticated in who they approach online gaming. That said governments don’t prosecute individual players. Instead they go after the companies that offer online poker services. That’s why some of the biggest online poker companies in the world, which are publicly traded, opt out of offering their services in markets where online gaming is not expressly permitted. Online poker sites and governments are slowly starting to figure out a way to regulate and tax online poker but it’s certainly taken some time. If you can’t access a certain online poker site that’s because they don’t want to risk offering their services in your particular market. What’s the Difference Between a Regulated and Unregulated Site? Regulated online poker sites are generally publicly traded companies that work in conjunction with governments around the world to offer online poker. It’s not all positive for regulated online poker sites, however, as they operate in fewer countries and tend to offer less financial incentives for players because they are beholden to share holders. Meanwhile unregulated online poker sites are generally available in more jurisdictions but are not officially permitted. That means that you never know how long these sites will operate. Most unregulated online poker sites have paid back players if they are forced to leave a market but you are exposing yourself to some amount of risk by playing on those sites. Your best practice will probably be to avoid holding a large amount of funds on unregulated online poker sites. Black Friday took place back in April of 2011. It’s a name created by poker players to describe the US Department of Justice seizing the domains of three of the most popular online pokers in America at the time (PokerStars, Full Tilt Poker and Absolute/UltimateBet). Mangers for each major company were indicted and forced to eventually make individual settlements with the government. Two of those sites essentially went out of business but PokerStars remains a major player on the global market. Black Friday but the brakes on US poker expansion and the market has cooled considerably since that time. Can I Trust my Personal Info to Poker Sites? Yes. In the old days online poker sites had trouble paying back their players at certain points but there are really no instances of identity theft being committed by online poker companies. The industry has just gotten more stringent since those days so you can rest assured that your personal information is safe. Can I Use My Funds for Casino/Sports Betting? This depends on your online poker site of choice. A large number of online poker sites also have sister sites that allow sports betting and casinos but those are generally segregated away from poker. If you’re really intent on having a one-stop shop for online poker and casino/sports betting than you might want to take a look at an unregulated site. Because unregulated online poker sites operate with fewer restrictions they sometimes offer a complete all-in-one betting platform with online poker, gambling and sports betting. Some sites even let you play Black Jack while you’re seated at the poker table. Does Bitcoin Count as Real Money Poker? Sure. The reality of the situation is that the moment you deposit Bitcoin on an online poker site it actually converts to USD. This is a major benefit for players because USD is a much more consistent currency and you don’t have to deal with losing a huge chunk of your bankroll due to Bitcoin variance. When you go to make a withdrawal the USD you’ve accrued will simply convert back to Bitcoin and it’s up to you at that point to cash that in for whatever real-world currency you prefer. Absolutely. 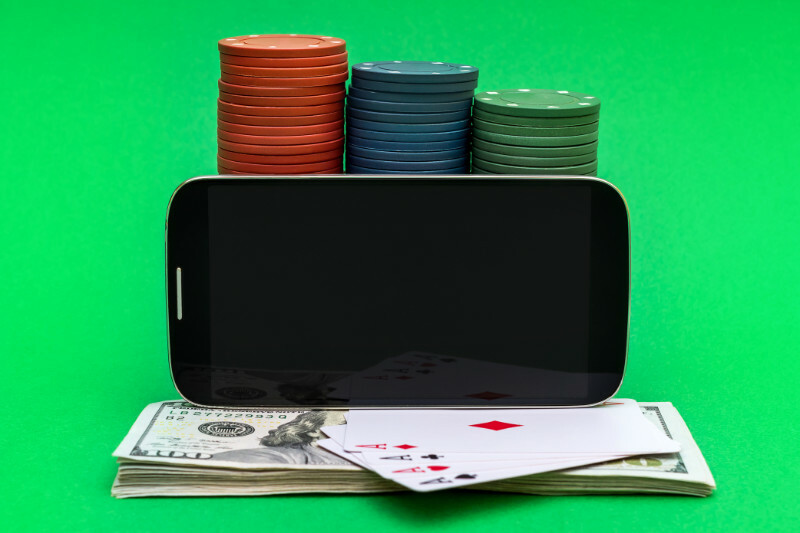 Mobile poker is one of the fastest growing segments of the industry and there are a large number of sites that offer apps for both Apple iOS (iPhone, iPad) and Android. Online poker is a great way to kill time on long commutes or in waiting rooms. You’ll generally only be able to play one table at a time but it’s still very fun. Mobile poker does depend on the country where you reside because every app on iTunes or Google Play has to go through a certification process. That’s why you won’t see any official apps for unregulated online poker sites. That doesn’t players who play on unregulated sites are out of luck, however. Most unregulated sites offer mobile through in-browser play, which generally isn’t as good as a standalone app but is available for every type of device that can run a browser.